Montecito is home to celebrities such as actor Rob Lowe, talk show host Ellen DeGeneres and media mogul Oprah Winfrey. 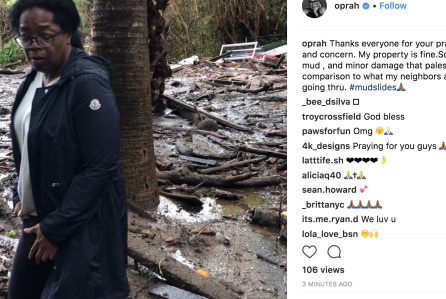 Just days after her powerful Golden Globes speech stole that glittery evening, Oprah Winfrey has posted video of the devastation of the Santa Barbara County mudslides that have claimed at least 15 lives and destroyed much of the neighborhood Winfrey calls home. Tuesday’s mudslide after hours of heavy rain have claimed at least 15 lives and numerous injuries in the area northwest of L.A., an area still recovering from wildfire. Dozens of people remain unaccounted for. The area is home to many Hollywood insiders, some of whom have taken to social media to provide updates.